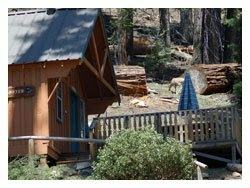 Trolling the internet for an article I was writing last spring, I happened upon the Silver City Mountain Resort, within Sequoia National Park (home of the 5 largest living sequoia trees in the world, and it's 240 miles from LA, and 280 miles for SF). I've never been there, because when you grow up in California like I did, usually Yosemite is the park your parents take you to. However, as beautiful as Yosemite is, I just think of it as so crowded, which is exactly what you don't want when you are setting out to be in nature. 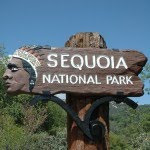 And from everything I read, it seems the general feeling is that Sequoia isn't crowded. 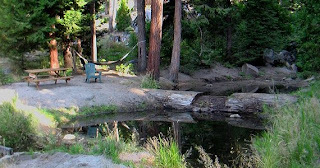 What I like about the Silver City Mountain Resort is that its a small historical retreat with simple but cute cabins, ranger-led campfires, horseback riding, and fly-fishing on the Kaweah River. 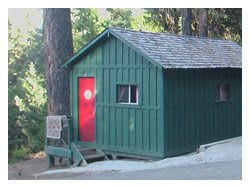 It just seems really contained and manageable, which is not usually the case with national parks. And apparently the restaurant there, Silver City, has some killer homemade pie (although only on Tuesdays and Wednesdays). One of my favorite resources for any kind of west coast travel, is Sunset Magazine. If you go to Sequoia, do check out all their stories on it--this one in particular breaks it down well.